Niels Wilhelm Gade was a Danish violinist, composer, conductor, teacher, and organist born on February 22, 1817 (Beethoven was already 47 years old.) He is considered the most important Danish musician of his day. Gade began his career in 1834 as a violinist with the Royal Danish Orchestra. Nine years later, Gade’s first symphony was conducted by none other than Felix Mendelssohn in 1843. Both Schumann and Mendelssohn became his friends during the five years Gade spent in Leipzig. When Mendelssohn died, Gade was made chief conductor of the Gewandhaus Orchestra in Leipzig (1847.) Unfortunately, he had to give it up the following year - don’t ask me why. 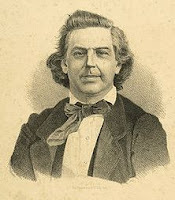 Back in Denmark, Gade became director of several musical institutions, taught at the Copenhagen Conservatory (where his pupils included Grieg and Nielsen), and played organ in various churches. Among his works (which are seldom performed) are 8 symphonies, a violin concerto, and several cantatas. Gade died on December 21, 1890, at age 73.